Super Star Rajinikanth is a happy man. His daughter Soundarya Rajinikanth is entering into wedlock with actor and businessman Vishagan Vanangamudi today in a grand ceremony at the Leela Palace. 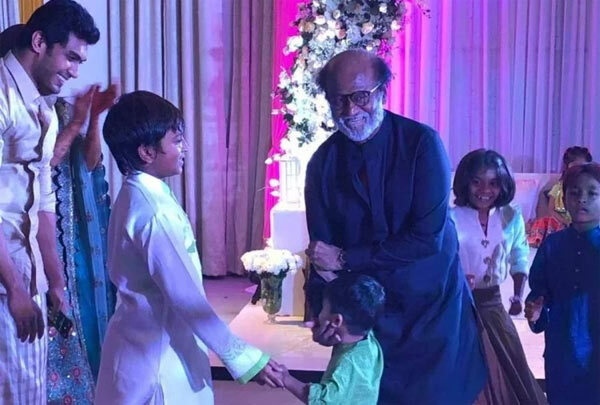 Already Mehendi and Sangeet were celebrated in a lavish manner and during the celebrations, Rajinikanth delighted all by dancing to the super hit song “Oruvan Oruvan Mudhalali” from his blockbuster film 'Muthu'. The wedding will be a private affair for close family members, relatives and friends. However, lavish wedding reception will be held for closest friends and family members followed by a cocktail party for the near and dear ones.